When it comes time to replace the range in your kitchen, one of the first decisions you will have to make is whether you want a gas or electric range. The fact is that each choice has its pros and cons, but most people tend to prefer cooking with one over the other. Yet if you have little experience with one or both of these options, you may be wondering which is best for you, and what the differences are between cooking with electric and gas ranges. To help you in making your choice, here are a few of the key differences between cooking with these two appliances. One of the reasons some homeowners prefer electric cooktops over gas is that electric cooktops provides a more stable cooking surface. This is due to the fact that with an electric cooktop you place your pots and pans on a completely flat, solid surface. 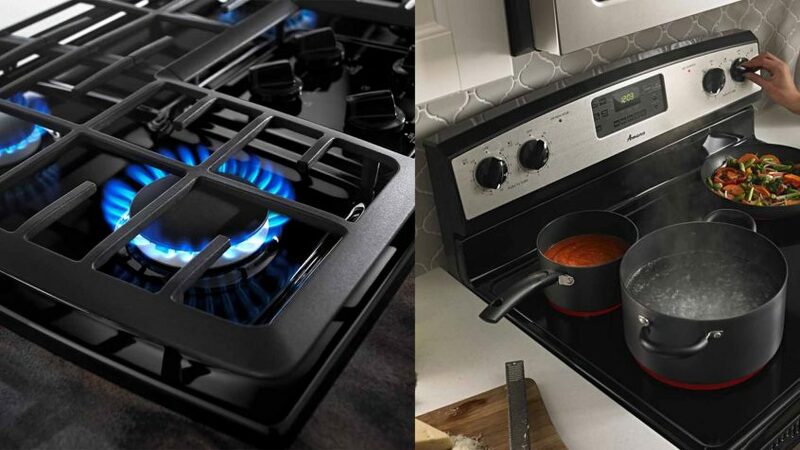 Contrarily, gas cooktops have grates that you place your cookware on over the flame. This surface can be slightly unstable, and makes some cooks nervous that they may knock over a pot or pan. Due to its flat surface, electric cooktops are also easier to clean than gas. Its even surface can be easily cleaned by wiping it down after you have finished cooking. With a gas cooktop, however, you would have to not only clean the grates, which can be a hassle, but you would also have to remove the grates in order to clean underneath them. Heat distribution is another area where gas and electric ranges vary greatly. Electric ovens tend to provide a drier, more evenly distributed, source of heat throughout than gas, which can help your food to cook more evenly. On the other hand, gas ovens often provide more heat toward the top of your oven, and will cook at different speeds in different places. This then often requires dishes in a gas oven to be rotated to provide even cooking. However, some homeowners prefer gas ovens as they can allow for better broiling of certain foods, and can allow some foods to cook crispier. Many homeowners prefer a gas cooktop due to the speed at which one can begin cooking. When you have an electric cooktop, you often have to wait a period of time for the electric heating elements to warm up before you can begin cooking. On the other hand, with a gas cooktop, your heating element will be ready to cook as soon as you turn on the flame. However, with either option, you will have to wait for your pot or pan to heat up after placing it on the burner before you will be able to begin cooking. When deciding between a gas and an electric range, you will also want to consider which fuel source will be better for your home. Do you have access to natural gas in your home to connect a gas range? If so, many homeowners find gas to be the superior fuel source for cooking, as natural gas is a cheaper, and more environmentally friendly, fuel source than electricity. Additionally, for people in areas with frequent power outages, gas is the more reliable fuel source, as a gas range will allow you to cook even during a power outage. Ultimately, there are pros and cons to both electric and gas ranges, and your preferences will likely determine which option is best for you. However, there are more factors than those mentioned here to take into consideration when purchasing a new range. Contact us to learn more about the differences between gas and electric ranges, as well as for advice on choosing between these two appliances.